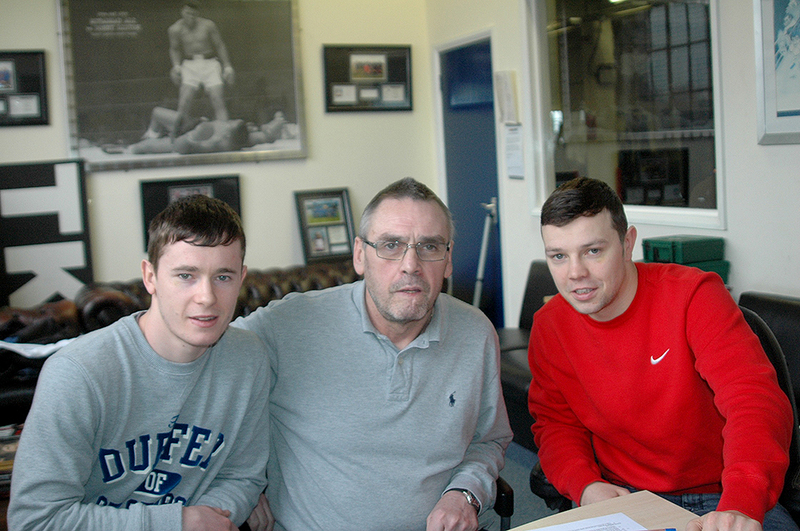 Eames Signs Irish Amateur Stars Paul and Anthony Upton. For the past few months famed manager/coach, and now promoter, Johnny Eames has been busy scouring both the domestic and European Amateur and Pro ranks, searching for top unattached prospects to sign with his and TRAD TKO business partner Gianluca Di Caro’s newly launched promotional outfit, Showtime Sports Events Limited. Two of the first to ink contracts are Irish Boxing brothers Paul and Anthony Upton, both of whom have had outstanding Amateur careers, that see the youngsters secure no less than seven National titles, as well as numerous International honours, between them. Speaking shortly after putting pen to paper, Anthony Upton Jr. said. “I started boxing at five years old, watching the likes of Nicky Cook, Colin Lynes and Kevin Mitchell, which made me want to be there where they was in the amateurs. Fought out of Dagenham and then moved onto West Ham, where ended up meeting Johnny Eames. Then we ended up moving out to Ireland, beating the Irish Champion in my first championship outing before going on to win five Irish Championships. I then went on to represent Ireland in the Four Nations in Wales, beat Wales and then I ended up beating England in the final and came away with a Gold medal. This sent me onto the European Championships in Ukraine in 2006, where I ended up beating a Turk, before getting robbed in my eyes in my fight against a Russian and ending up with the Bronze medal. I then went on to win the Multi-Nations Cup, a Multi-Nations Bronze and represent my country a number of times, that’s about it really and now it’s time to turn pro. We knew Johnny from West Ham, so decided to come and talk with him, after hearing the plans of the TRAD TKO/Showtime Sports Events team I knew it was the move to make, so here we are. We’re going to be training out of Legends Gym and TRAD TKO Gym, under Johnny Eames and we’ll progress from there. “I’m really please to be turning pro with TRAD TKO and Showtime Sports Events, they look to have a big future and I want to have a big future with them. I love fighters like Billy Joe Saunders, who I look forward to training alongside here at the TRAD TKO, Winky Wright, who’s a great technical boxer, Floyd Mayweather and Rocky Marciano, they’re role models to me, they’re classy boxers. I had a good amateur career, was a two time Irish National Champion, Dublin Champion, Ulster Senior Champion, Four Nation Silver Medalist. I lost out on a Commonwealth games spot by two points, lost to eventual Gold Medalist Paddy Gallagher, who’s pro now. “I remember Paul and Anthonyfrom when I was leaving West Ham to start my professional career, as a trainer, they were young kids just starting out in the juniors. I didn’t know too much about them, because I moved on to the pros as you know, but they have both had great amateur careers. They’re actually two of five brothers, three of them have just turned pro, the oldest has just turned pro with my good friend Ricky Hatton and I’m sure he’ll do well up there. Paul and Anthony didn’t want to relocate to Manchester, they’re happy here in London, so because of the West Ham connection they’ve come along to sign with me. Young Paul has won two National titles, I believe, over in Ireland, All Ireland titles. He won Silver at the Multi-Nations. Anthony has had five All Ireland titles, European Bronze and a Multi-Nations Gold, so it’s obvious they are two boys that have got extreme talent.